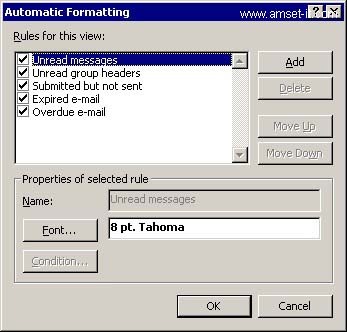 Choose the mail format tab. At the top, make sure that "use Word as your email editor" is NOT selected. In the middle (Under Stationary and Fonts) click on the "Fonts" button. You can now choose different fonts, sizes and colours. Simply press the Organise button on the taskbar or find it in the Tools menu. Then click on "Using Colours". Choose "Automatic Formatting" in the top right corner. Plain Text can be read by all email clients - whether that is a PC, laptop, handheld, mobile phone, web mail client or fridge. If you are unsure what the recipient is going to use to read your message, use plain Text. If you want to change the format of a message "on the fly" (i.e. after you have started creating it) click "Format" when editing the message and choose "plain Text" from the list. When you change the font for Plain Text, then that change is NOT seen at the other end, as the email is just plain text. It can make it easier on the eye when reading and writing messages. In most cases "Rich Text" is ok as the formatting of rich text is carried with the message. Although think before you use an obscure font, size or colour. The recipient might not like your choice or have the font installed. HTML messages are still being used, however increasingly some companies are blocking them or stripping the formatting off. Therefore as you also cannot guarantee what the recipient is using to read the messages or that the message might not look correct when received Plain or Rich text would be the better choice for external emails. For Internal messages or sending to people you know can see the message (perhaps because they send you HTML messages) HTML is fine. In the main Outlook window, choose "View" then "Current View". Select messages if not already chosen. From the same "View", "Current View" menu, select "Customise Current View". Choose "Other Settings" to change the font and colours.